This year, I’ve been a little behind on shopping for Christmas presents!. 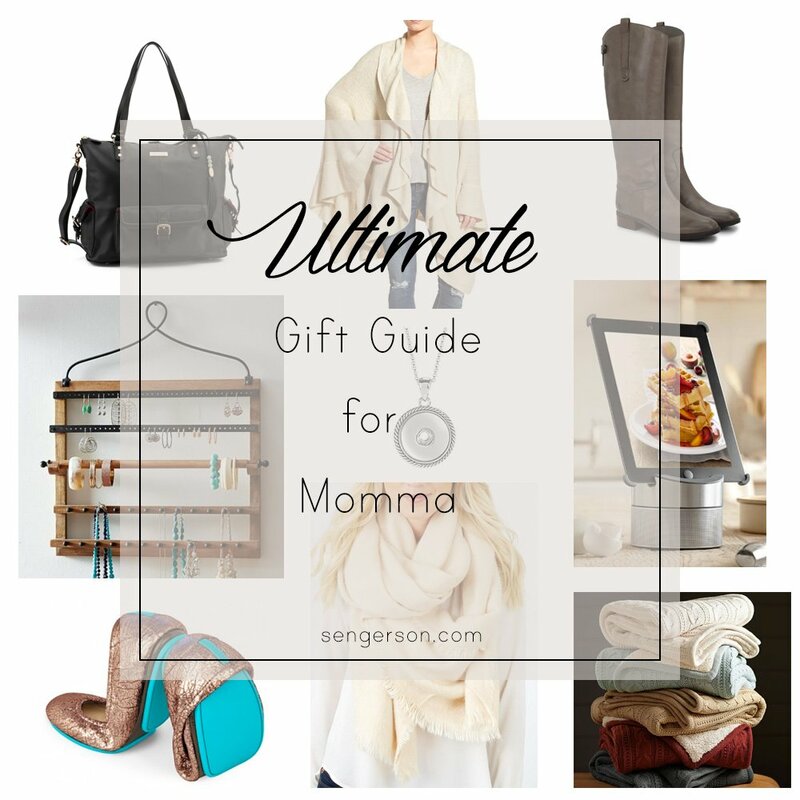 So as I got to thinking about my list, I’ve rounded up an ultimate gift guide for anyone shopping for their momma’s out there. Each of these items are tried and true, and I just know yours will love them! This is is not only great for the Christmas gift giving, but bookmark it for Valentine’s Day and Mother’s Day! Lily Jade bag. This was is the Meggan that you can read my review about here. This bag is gorgeous, and versatile! Can you believe that this is a diaper bag? I use it as a laptop bag to work! Ruffle Trim Cape. This is one size fits all, but its so comfy! Its like acceptable blanket wearing in public! Sam Edelman Penny Boots. These are real leather boots! If your mom only has pleather, its time to upgrade her to some real amazing boots! Jewelry Organizer. I plan on writing a detailed review about this, but you have got to trust me. This jewelry organizer is one of the best purchases I’ve ever made! Ginger Snaps Jewelry . To go with that jewelry organizer, get your mom started on this jewelry line. She can snap her necklaces on and off based on her outfits! iPad holder for the kitchen. Does your mom use her iPad around the kitchen? If so, get her this handy holder that she will love. Tieks. You had to know I was going to add them in here after my review here. Enough said. Scarf. This scarf is beautiful and would go with most outfits. 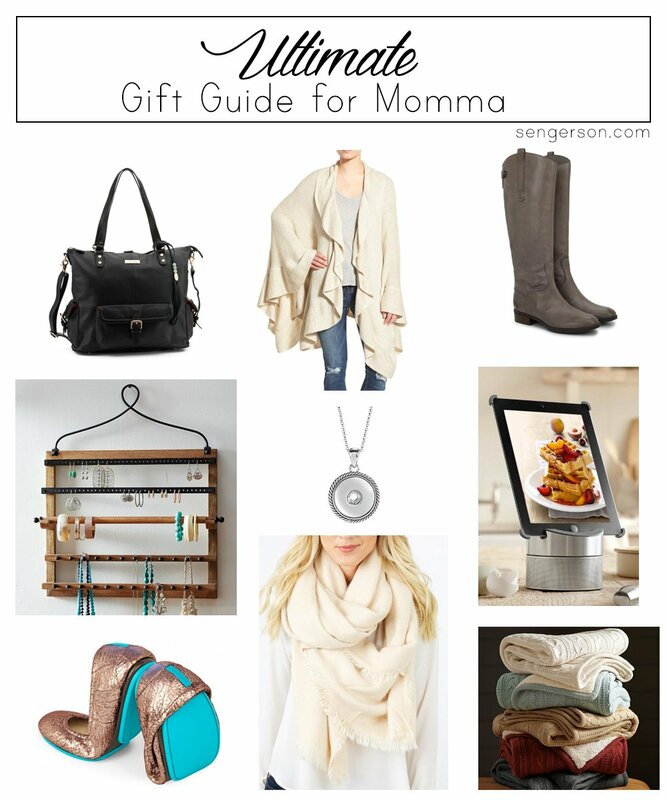 Its neutral and any mom would love this. Cozy Cable Knit Blanket. Let your momma cozy up on the couch with this blanket, and she will think of you! Have you finished all your holiday shopping?! Follow me on Instagram here for more mom finds! Pin the image below and follow me on Pinterest for more great ideas!